Every day, more and more people are using their smartphones and tablets to surf the web and make purchases. Currently smartphone make up a quarter of all web traffic. Take a look at your Google Analytics, how many of your visitors are coming from a mobile site? More importantly, how many visitors are you losing because your website isn’t optimized for for mobile? That’s a lot of people. And if your website isn’t optimized for mobile, you could be missing out. Fifty percent of people said that even if they liked a business, they will use them less often isn’t mobile-friendly. People like mobile websites. If they’re using a smartphone or a tablet to view your site, they expect your content to work accordingly. Websites that aren’t optimized for mobile are a hassle. And people won’t put the effort into trying to figure how your site works. It’s possible that your current site may have content that isn’t compatible with most mobile devices, like Flash. Broken links and content like this reduce your ranking in search engines and annoy users. Forty-eight percent of consumers reported feeling frustrated and annoyed when they encountered a site that wasn’t optimized for mobile. This shift to mobile Internet usage means businesses have to rethink their websites. They now have to consider how customers are visiting the site, which means a completely new set of user requirements. Increased traffic- Google likes mobile websites. By having a mobile site, you’re putting yourself in a position for people to find you whenever they’re using their smartphones or tablets. People don’t wait until they’re by a computer to do a search, they’re searching on their phones while they’re commuting, watching TV, even lying in bed. 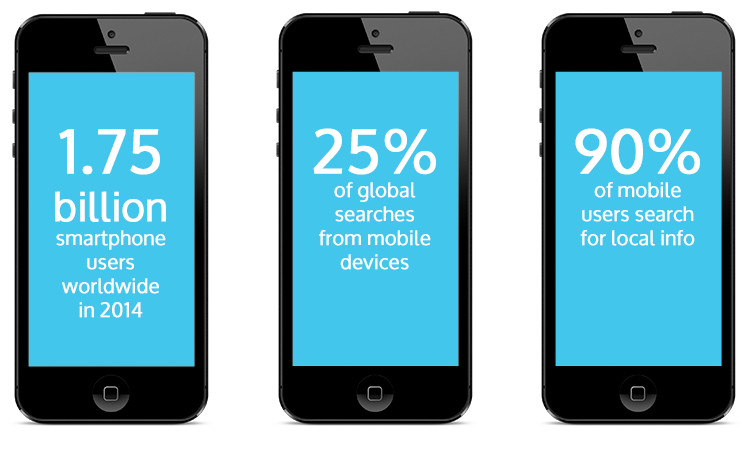 Search engines recognize mobile websites and rank them higher in search results done on a mobile device. Reduce bounce rates- When users come to your website, they decide on average within .2 seconds if they’re going to stay. If your website is hard to navigate, confusing, and doesn’t look right on their screen (which most desktop sites don’t), they’re going to leave without even looking at your content. Having an optimized site that is easy for your viewers to navigate, will keep them around longer, which might eventually result in a new customer for your business. Increase conversions- A website that’s mobile-friendly makes it easy for your customer to do what you want. Want them to fill out a form to sign up for your email newsletter? It probably would help if the form fit in the screen and the “submit” button was easy to press with a thumb. It’s hard enough to get a conversion, and not having a mobile-friendly website is just making your job harder. Does it load in three seconds or less? Are your eyes attracted to the key selling points? Are you able to recognize the call of action? Are you able to act? Would you spend time on the site if it was not your own? If your current mobile site isn’t up to speed, or your website isn’t optimized for mobile, we can help! When you work with NEXTFLY to optimize your site, you work with a professional. We are an Indianapolis Web Design company that knows the industry standards, and know what works and what doesn’t. We have a proven track record of improving conversion rates and reducing bounce rates when our clients optimize their sites for mobile. We start by looking at your existing website. We take into consideration how your current visitors are using the site, and how you want to them to use it. Doing this, we create a seamless transition between desktop and mobile sites, we work with your existing design and optimize it to fit both smartphones and tablets. Give NEXTFLY a call today to see if we can help mobilize your website.